Personally, I think that you can't do much better than decorating with food--particulary fresh produce. 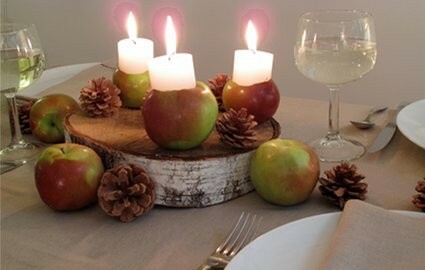 And what could feel more like fall than decorating with apples? (Well, maybe decorating with pumpkins, but we'll leave that for future posts!) Personally, I love a pretty bowl full of ripe, fragrant apples, but here is an idea to jazz things up a bit. 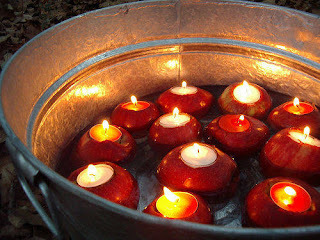 One of my favorite ideas this season is to use apples as candle votives. This would be gorgeous for a fall dinner party. 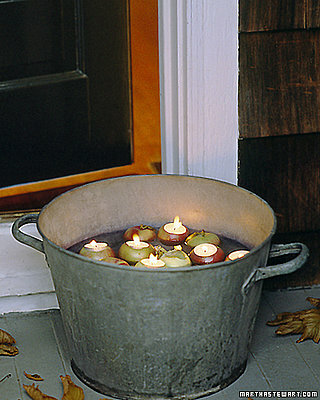 Or you could do something like this to put on your front step at Halloween instead of jack-o-lanterns.